Supersprings model ss13, were installed in June 2014, in an attempt to strengthen LOAF's rear suspension. After driving an additional 50,000 kms, we noticed they 'appeared to have lost their effectiveness' and we weren't sure why? 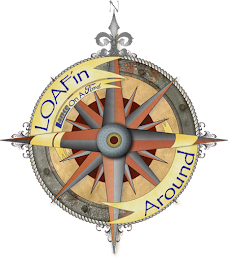 Contributing technical author for this post, Shane Hanthorn, has been LOAF's passionate, lead mechanic since June of 2015. Consultation with Shane and service manager Chris at Cannifton Garage resulted in an eventual upgrade to LOAF's rear suspension. Cannifton Garage originated as a spring shop and has been in business for more than 60 years. 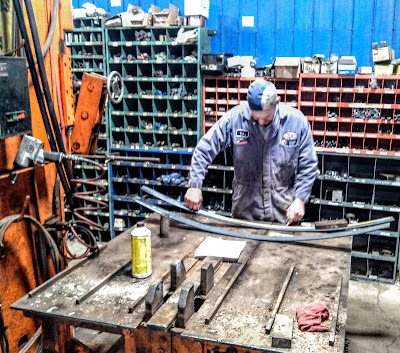 They have the capability and equipment to build springs, u-bolts, and suspension components for everything from an old classic car to a brand new tri-axle dump truck. Our original setup for the supersprings, was made to the lowest pin location (see left and right spring ends below). This still left about 1 inch of sag in the rear with the camper fully loaded (wet), so the pins were then moved to the middle location. This resulted in an improved rear stance. We also installed Bilstein 5100 series shock absorbers 1500 kms later and a rear Hellwig big wig sway bar 16,000 kms after that. Initially, these combined changes improved the rig's drive-ability quite a bit. However, after several extensive road trips totalling an additional 40,000 kms, we appeared to be experiencing a 1 - 1.5 inch sag in the rear and the camper was also swaying, once again. In an attempt to tighten the rear suspension even further, three different garages tried raising the supersprings to the highest setting; all (including Cannifton) were unsuccessful. LF - 40.75" , RF - 40.5", LR - 40", RR- 39"
The truck sat 1" - 1.5" low in the rear; lowest on the right side, due to the additional weight of the camper slide out. Upon inspection, the left rear superspring had caught and damaged the emergency brake cable and was rubbing on the skid plate for the fuel tank. Due to the location of the rebound clips on the original spring pack, the supersprings were incapable of self adjusting as designed and it was also physically impossible to increase the tension on them to their highest setting due to the dimensions of the springs. LF- 40.5", RF- 40.5", LR- 39", RR- 38.5"
Vehicle suspension is designed to handle 2 types of movement, jounce and rebound. Sway occurs when the different sides of the vehicle move in opposite directions. Weight increases the amount of movement. Decrease the amount of movement, decrease the sway. It was decided, to rebuild the rear suspension by adding 2 new leafs to LOAF's original spring pack (with lower helper spring) and to re-install the original upper helper spring that had been removed in the past to accommodate the supersprings installation. The factory suspension in this F350 consisted of a 2 leaf spring pack with upper and lower helper springs ... but for this size of truck, the springs are huge. New material was ordered to match LOAF's existing leafs which are 0.499" thick by 3" wide. Fellow mechanic Rick Wilson, completed the new spring pack build. 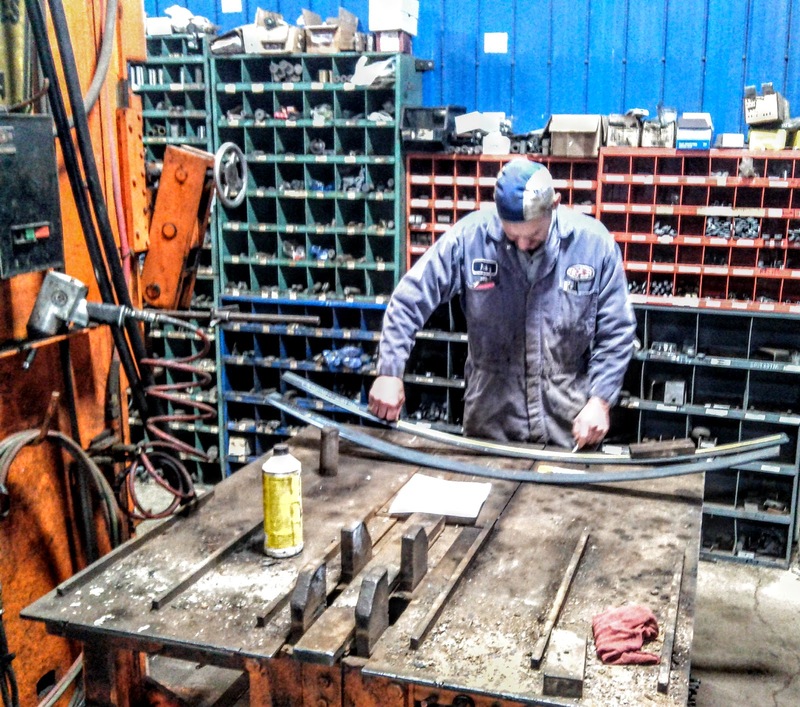 Rick has been building springs at the Cannifton Garage, for roughly 40 years. The process ... determine where in the pack the springs will be located, and then measure and cut to length. The required locations for holes are then measured and drilled to accommodate for the centre bolt and rebound clips. At this time, plastic inserts are placed between the springs to eliminate chaffing and noise. Utilising an original spring as a guide, a 100 ton press (with anvil and cradle), is used to arch the new springs to match the arch of the original spring in the pack. For LOAF, the springs arch was increased for the right side of the truck to compensate for the extra weight of the camper's slide out. New u-bolts were bent to the proper shape and length using the 100 ton press and together with new centre bolts and rebound clips; the new spring pack was re-assembled and re-installed. Before : LF- 40.5", RF- 40.5", LR- 39", RR- 38.5"
LF: 40.5", RF- 40.5", LR - 41.25", RR - 41"
LOAF now sits roughly 3/4" higher in the rear than the front and is within 1/4" side to side. The load capability / side for this suspension upgrade is 6800 pounds, which is well within the rigs' payload requirement. ... and that's exactly what happened. When exiting a corner, LOAF now returns to centre and stays there, no more pendulum effect. I only had a short drive home from Belleville but the improvement in handling characteristics was quite noticeable. We are very satisfied with this upgrade. We have a 20,000 km combined road trip and overland drive planned for 2018; I'll update my review of this suspension upgrade following that. We had hoped the supersprings ability to 'self-adjust' would resolve our initial sag / rear level issues with our TC rig, but that was not the case. Don't count supersprings out as a manufacturer of heavy duty helper springs though; their designs may work well with other truck suspension and camper configurations ... just not ours! Wow That was interesting.... problem solved?